such as Zion, Mount of Olives, Har Megiddo and countless others. Daughter of Zion, a term found numerous times in the Old Testament, was perhaps a term for a priestess of Asherah. It later came to mean the “City of God,” or Jerusalem herself. As the “official” state worship became increasingly male oriented, and the establishment became hostile toward all forms of Asherah worship, a time of conflict and bloodshed lasting over a hundred years began. Those that still clung to Her worship paid the price with their lives at the hands of King Josiah and other rabid Yahwists. (Story in the 2nd Kings ). But She could not be torn from the hearts and souls of Her people. Exercise 5: (Extra Credit) If you’re really brave, not worried about being called a “heretic Jezebel,” try making some Asherah cakes. Add raisins if you can! “Even as the LORD loves the people of Israel, though they turn to other gods and are fond of raisin cakes.” Hosea 3:1 The commentary for that verse says: “Raisin cakes: offerings to the fertility goddess Ashera, the female counterpart of Baal; cf Jer 7:18; 44:19.” The name Baal means simply Lord or husband. In modern hebrew, the word for husband is baal, used by millions of Israel wives to refer to their hubbies. *A word about snakes: The Serpent, though a frightening symbol because of its ability to bring death, stood also for ancient wisdom and immortality. (Note that it hung out in the Tree of Knowledge and preached a doctrine of immortality, “ye shall NOT surely die.”) Many early societies revered the snake and used it to symbolize different ideas. 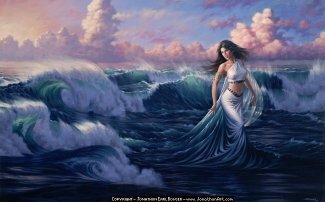 She was the wife of El in Ugaritic mythology, and is the goddess who is also called Athirau-Yammi: “She Who Walks on (or in) the Sea.” She was the chief goddess of Tyre in the 15th century BC, and bore the appellation qudshu, “holiness.” In the OT Asherah appears as a goddess by the side of Baal, whose consort she evidently became, at least among the Canaanites of the south. However, most biblical references to the name point obviously to some cult object of wood, which might be cut down and burned, possibly the goddesses’ image (1 Kings 15:13, 2 King 21:7). Her prophets are mentioned (1 Kings 18:19), and the vessels used in her service referred to (2 Kings 23:4). 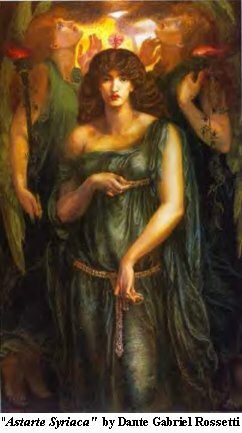 The existence of numerous symbols, in each of which the goddess was believed to be immanent, led to the creation of numerous forms of her person, which were described as Asherim. The cult object itself, whatever it was, was utterly detestible to faithful worshippers of Yahweh (1 Kings 15:13), and was set up on the high places beside the “altars of incense” (hammanim) and the “stone pillars” (masseboth). The translation of asherah by “grove” in some translations follows a singular tradition preserved in the LXX and the Vulgate which apparently connects the goddess’ image with the usual place of its adoration. A Hebrew inscription on a broken storage jar, found in Kuntillet ‘Ajrud in north-eastern Sinai and dated from the beginning of the eighth century BCE has three primitive figures: a standing male figure in the foreground; a female figure just behind him; and a seated musician in the background. The Hebrew inscription above the drawing reads: ‘I bless you by Yhwh of Samaria and his Asherah’ (Dever, 1984; King, 1989). Furthermore, a tomb inscription from el-Qom in Judea, dated to the eighth century BCE too, concludes with the words: ‘to Yhwh and his Asherah’ (Margalit, 1989, 1990 and further references there). Asherah, like Anat, is a well-documented goddess of the northwest Semitic pantheon. We remember that, according to the Bible itself, in the ninth century BCE Asherah was officially worshipped in Israel; her cult was matronized by Jezebel who, supposedly, imported it from her native Phoenician homeland. Other traces in the Bible either angrily acknowledge her worship as goddess (2 Kings 14.13, for instance, where another royal lady is involved), or else demote her from goddess to a sacred tree or pole set up near an altar (2 Kings 13.6, 17.16; Deuteronomy 16.21 and more). The apparent need for the hostile and widely distributed polemics against her worship constitutes evidence for its continued popularity. Linguistically, Margalit claims (1989), ‘Asherah’ signifies ‘[she] who walks behind’, displaying a prototypic if divine attitude that befits a wife (and is reflected in the Kuntillet Ajrud drawing). Thus both the partially suppressed and distorted biblical evidence and the archaeological evidence combine to suggest one conclusion. The cult of a goddess, considered the spouse of Yhwh, was celebrated throughout the First Temple era in the land, and beyond this period at the Jewish settlement in Elephantine (in Egypt). entry states: Etymology: She who walks in the Sea. Was the Hebrew God also a Woman? The Bible gives the impression that all ancient Jews shared a common belief system … with only an occasional group straying from the fold. But the evidence paints a different picture. As Dr. Patai states, “… it would be strange if the Hebrew-Jewish religion, which flourished for centuries in a region of intensive goddess cults, had remained immune to them.” Archaeologists have uncovered Hebrew settlements where the goddesses Asherah and Astarte-Anath were routinely worshipped. And in fact, we find that for about 3,000 years, the Hebrews worshipped female deities which were later eradicated only by extreme pressure of the male-dominated priesthood. Also see this website that sings the Hail Mary in Hebrew to different melodies. Here is a translation of the Hail Mary into Hebrew. Update: The document ‘Mysteries of the Rosary – Razay Ha Moshiach’ has been deleted from Scribd.com. If you find it, send us the link and we will add it back here — and you will get one month’s free Mystery School dues!